Freezing Time | The Messy Palette . . . The mantel full of clocks pictured above is the realization of a little dream that cheered me on last summer, as I packed 280 boxes in preparation for our move to Southern Wisconsin. 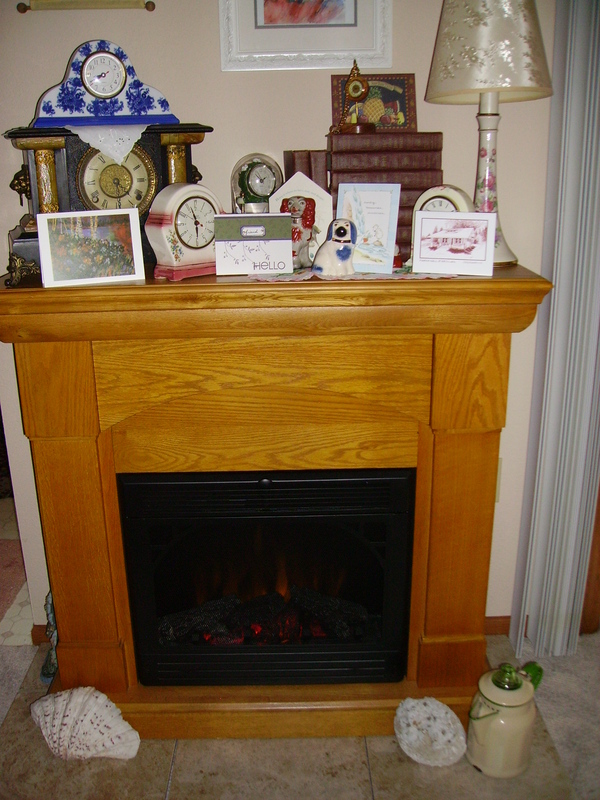 As the box towers in our living room grew higher, and I grew weary from packing, I thought of how our clocks would cluster and grace the mantel of our electric fireplace in our new home. Each clock has a story behind it. The large, antique clock on the left, with lions’ heads, was won at an auction–for a very reasonable bid. The tiny wooden gem in front of the auction find was made for our 50th wedding anniversary by our friend, Lee Veldboom. It’s a replica of a watch and fob, similar to what my grandfather always wore in his suit pocket. The others featured in the front row, and the imitation flow blue clock on top of the antique one, were gifts from Joe for special occasions. Our latest addition, the vintage percolator equipped with a clock face, was given to us by our daughter Laura for Christmas. 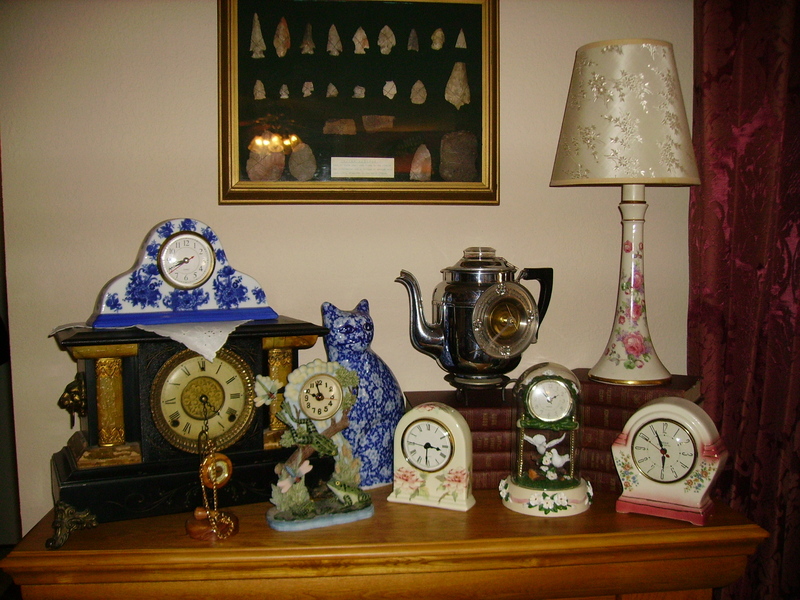 Keeping company with the clocks on the mantel are a calico cat, stacks of books, and a lamp. Most of these clocks would function if I bothered to put batteries in them. But strangely enough, I have a “thing” about clocks that don’t run. I absolutely love them. The concept of time standing still while capturing the essence of halcyon moments has great appeal for me. My clocks represent memories frozen in time. The clocks speak to me of a major mission accomplished. I reflect on the fact that we actually made this move. I thank God for everything the move has implied in terms of proximity to family members and an easier lifestyle for Joe and me. And I mentally salute the clocks–for the decorative vision they gave me during a stressful summer!